All things are growing older: The world is growing older; we ourselves are growing older. A few more summers, a few more winters, a few more sicknesses, a few more sorrows, a few more weddings, and a few more partings, and then– what? Why, the grass will be growing over our graves! –J. C. Ryle (1816-1900) Anglican Bishop of Liverpool, in his 1877 book Holiness. 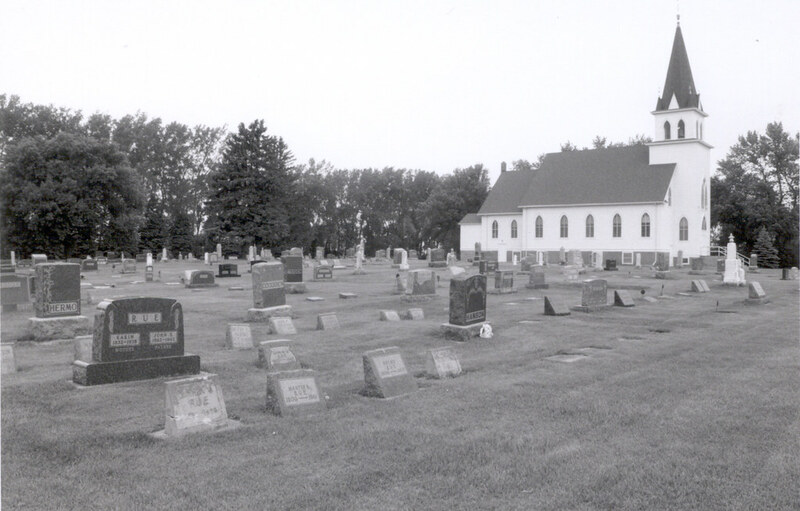 Whenever I preach in Singsaas, my grandparents’ church on the Minnesota-South Dakota border, my eye wanders through the window to see the gravestones nestled around the church with its white spire pointed heavenward. Sleeping there are five of my great-grandparents, my four grandparents, many uncles and aunts and cousins. In another prairie cemetery a few miles away my parents and our son rest side by side. There have been many changes since 1870 when the immigrants established their church. My grandparents’ homesteads are in the hands of other farmers, and the grandchildren are scattered. The only piece of this earth that the family now occupies is the graveyard. I find nothing melancholy about having them there. Here the rich past and the promise of a glorious resurrection come together. When my cousin’s 17 year-old son was killed, his parents, remembering a chance remark he had once made about resting in the Pacific, arranged a service at sea and had his ashes dropped into the great waters. I remembered that Mahatma Gandhi had asked that his ashes be given to the life-giving Ganges River of his land, and that Jawaharlal Nehru had ordered his to be taken into an airplane and scattered across his beloved India. I find nothing distasteful, but even something beautiful, about such expansive resting places. But I’m glad I can wander around the graveyards of my family. My grandchildren love to go from marker to marker, listen to the recollections and legends I have to tell about their forebears, and be carried back to the roots of their histories. And while I don’t then preach a sermon on the resurrection, I know their young minds move from these dead to the celebrated company that awaits them. Rarely now are people allowed to know death at first hand. No longer does a family live with the labored breathing of death in the next bedroom; no longer do the dead lie in state in the living room; rarely does a whole community assemble for the funeral. So death, such an integral part of life, is smuggled out and hidden from view. At Singsaas, the cemetery’s sober reminder that death is real is matched by the pulpit’s clear and powerful word of a resurrection. I Corinthians 6:14 — By his power God raised the Lord from the dead, and he will raise us also. This entry was tagged resurrection. Bookmark the permalink.